Thank you for your continued efforts to develop the Northern Strand Community Trail from the Mystic River to Lynn. We are inspired by the leadership and dedication demonstrated by your team and Governor Baker, and we appreciate your extensive community outreach as the pathway is developed over this coming year. We would like to comment on the inadequate width of the pathway, as it has been presented by the project team, as a contiguous 10’ width for the entire length. The standards set forth in AASHTO and MassDOT’s own separated path design guidelines recommend 10’ only on low-volume pathways, with a recommendation of 12’-14’ for paths with high pedestrian volumes. Based on current and projected usage of the pathway, we believe the Northern Strand Community Trail should adhere to the standard of 12’-14’, or even potentially exceed that, wherever possible. It is important also to note that these path standards do not take into account the emerging technologies of micro-mobility devices and electric bicycles, which will invariably be used for transportation purposes on the Northern Strand. This goal of widening the pathway is to mitigate conflicts between users, and to plan for the area’s expected growth and development that will bring more people out onto the path in the coming years. We believe that the pathway’s intention is to serve the community and provide safe recreation and transportation options, and thus we implore the EOEEA and the project team to widen the pathway. The communities served by this pathway are dense residential and commercial areas. The communities of Everett, Malden, Revere, Saugus, and Lynn are cities and towns that are developing at an expected growth of more than 12% by 2040 (see: MAPC Population Growth Projections). By comparison, many other regional pathways are already strained in capacity due to their narrow designs, and we see issues of narrowness contributing to user conflicts on the Minuteman Bikeway, the Paul Dudley White Bike Path, and the Southwest Corridor. This pathway is also a crucial corridor for the East Coast Greenway, a contiguous route that connects 15 states with 3,000 miles of trails. We can assume the Northern Strand will receive heavy usage, and we must design and build accordingly to ourprojections. Further, as you have heard at every public meeting, the worry about conflicts between bicyclists and pedestrians/joggers is a widely held concern. A wider pathway means a safer pathway, with more room for more people at varying speeds to maneuver and pass safely. We feel that a 10’ pathway is not sufficient to provide space for two-way walkers, joggers, strollers, and bicyclists to co-exist without conflict. Since safety is of paramount concern, especially as this pathway serves users young and old, we recommend widening the pathway to 12’-14’, or alternatively providing separate spaces for bicyclists and pedestrians/joggers where right-of-way allows. We appreciate how the design and construction of the Northern Strand has a funding limitation set by the Commonwealth’s budget, and this may impact the width of the path by requiring less pavement as a cost issue. However, the cost of additional 2’-4’ of pavement at the onset of construction is considerably less than having to go back and widen the pathway after construction and landscaping has completed. Widening the pathway where possible on Day One only makes financial sense. Lastly, we should expect the Northern Strand to be used as a commuter route, and thus will have users after dark during the months of October – March (since we live in the Northern Latitudes and the sun sets early in the evening). We ask the project team take into account lighting wherever feasible to provide safe passage for pathway users. Along this argument, we also acknowledge that lighting elements will eventually be installed along certain sections of the pathway, once enough people are using the pathway to provide a safe environment. Thus, we ask that the EOEEA and the project team install conduits for lighting during this initial construction of the pathway where lighting is expected to be installed in the future, to more easily facilitate and lower the cost of installing lighting later on. We appreciate your consideration of these issues of wider pathway and lighting elements for the Northern Strand. We applaud your team and the leadership for supporting this impactful project, and we look forward to the benefits it will bring the region for better health and wellness, smart growth development, and sustainable transportation connecting these cities and towns. In 2012, local artist and Malden resident Sharon Santillo reached out to Stella to reconnect with his hometown. As the chairperson on the newly formed Mayor’s Advisory Committee on Walkability, Santillo came up with the idea of incorporating Stella’s artwork into wayfinding signs throughout the city; these signs tell how long a walk it is to key city destinations. “I contacted his office requesting copyright permission and at first his office was unclear on what I was asking,” said Santillo. “So I sent him a mock-up of the idea using downloaded images of his artwork. I know the copyright rules, so I was holding my breath that they would understand it was just for them to get a visual!” She was thrilled that her efforts over many months resulted in a resounding “yes” from the artist, granting permission, free of charge. 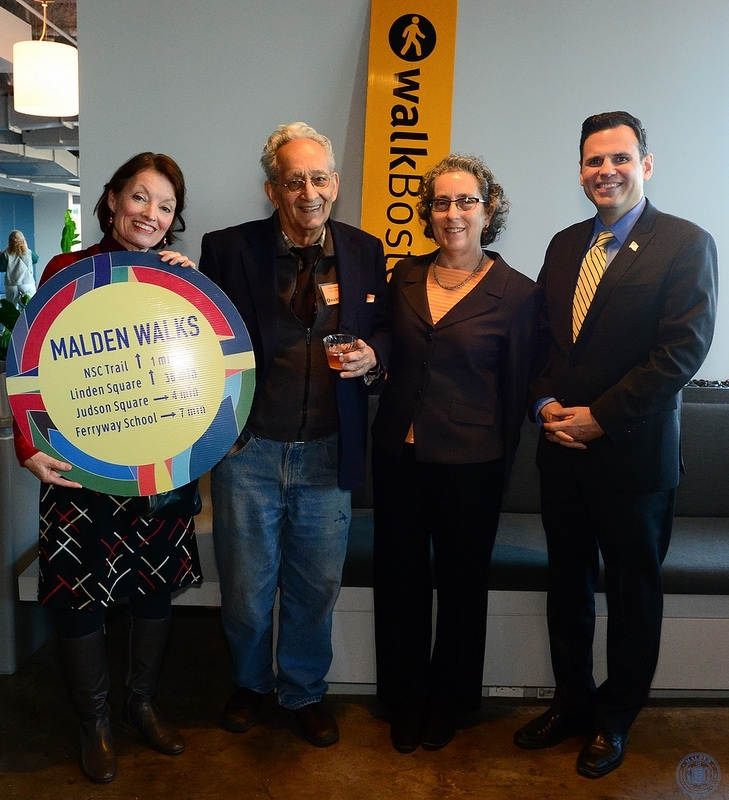 When the signs received recognition from WalkBoston for being the first to combine fine art with wayfinding, Santillo again reached out to the artist to invite him to the “Golden Shoe Award” ceremony at MIT. (The New England Resource and Development Center at MIT holds several of Stella’s works in its gallery collection.) To her great surprise and delight, he accepted the invitation and attended the ceremony where he was presented with his own Golden Shoe. A cadre of Malden arts enthusiasts came out for the event and met with Stella, including Dora St. Martin, the Executive Director of the Malden Public Library. Walking in Malden is easy and fun; the more you walk, the more beneficial it is to your heart and soul. One hour of brisk walking can add two hours to your life [American Heart Association]. Malden has many opportunities to walk. Neighborhoods are close together, retail areas are easy to find, safe sidewalks are abundant, and there’s a great deal to see. The map shows 4, 5, and 8-minute incremental walks within Malden. This will help you to plan your twenty-minute daily walk. Snow and ice can present challenges to walkers and runners, which is why many Massachusetts cities and towns hold property owners responsible for clearing sidewalks on or next to their property. Still, sidewalks sometimes remain uncleared and potentially hazardous days – or even weeks – after a storm. WalkBoston has basic recommendations to improve sidewalk snow and ice clearance, and “Keep It Clear: Recommendations for Sidewalk Snow and Ice Removal in MA” (PDF), but listed below are ways that you can report problems today to help prioritize clearance. Please tweet us @walkboston or email us – info@walkboston.org – to add more communities and agencies to this list. Want to help your neighbors? Have shovel, will travel? Need some help or know someone that does? Join WalkBoston on Snowcrew, BECOME A YETI! Snowcrew matches neighbors to neighbors to help shovel out in the next storm. Many runners are also training for the Boston Marathon along the course that stretches through 8 Massachusetts towns. Help clear intersections or identify spots that need clearing to make it safer for all users – and brag a little bit about how you helped them out in April when you are cheering the runners on! Commonwealth Connect – This award-winning app links cities and towns throughout Massachusetts. You can report problems to local governments, even if you don’t know who to contact. While there are specific ways to report below, Commonwealth Connect ties into many of those 311 systems. Learn more and download Commonwealth Connect for Android or iPhone. To report snow/ice violations to Town bylaws call APD dispatch at 781-316-1212 or submit a Snow/Ice Violation Request in the Request/Answer Center. Select “Make A Request” then select “Snow/Ice Violation” request. Login required. The BOS:311 app helps residents and visitors improve City neighborhoods. Visit www.newtonma.gov and click on the 311 icon (direct link here). You can also download the 311 app to your smartphone from the homepage. Contact the DPW at 978-744-3302 or through seeclickfix.com with snow removal and plowing concerns. The MBTA will clear snow from all MBTA-owned bus shelters and stops along the following key routes: 1, 15, 22, 23, 28, 32, 39, 57, 66, 71, 73, 77, 111, 116, 117. For a full list of MBTA-owned bus shelters cleared by the MBTA, please click here. Many areas around bus stops are responsibility of the community or property owner. If you tweet at the MBTA, make sure to also get in touch with the town. Join our Mailing List to keep up to date on advocacy issues. Like our work? Support WalkBoston – Donate Now!